If you know when to hold ’em and know when to fold ’em, you’re halfway to enjoying today’s food holiday already. November 17 is National Baklava Day! It’s also National Homemade Bread Day. A tempting holiday to celebrate, especially given the fact that Tara makes a really good beer bread from scratch that I can never seem to get enough of. But baklava is more exotic, and with our food challenge rapidly winding down – seriously, only 44 days left! – we want to take advantage of some of the more unique foods we might not otherwise eat again for a long time. Or ever. So, baklava it is. This classic Mediterranean dessert is made with layers of phyllo dough, nuts, butter, and sugar, and topped with syrup or honey. 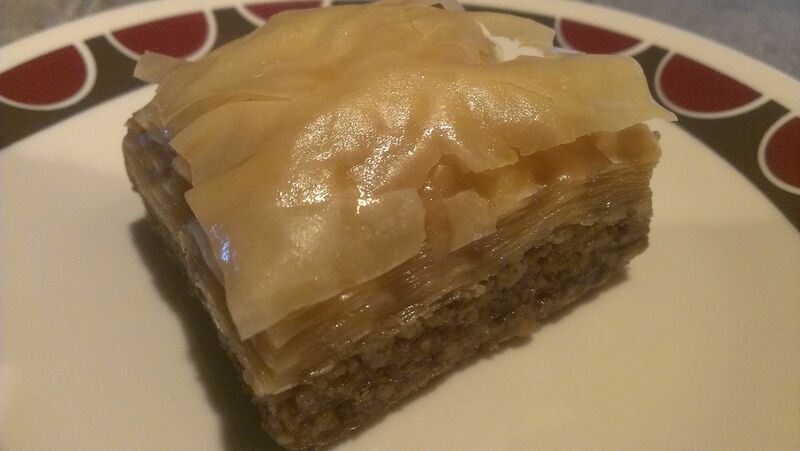 Assyrians have been baking similar sweet layered pastries since the 8th century B.C., though the exact origin of baklava itself is in dispute. Even the name itself is a mystery. It may come from the Mongolian root baγla meaning “to tie, wrap up, pile up” while baklağı and baklağu point to possible Turkish roots. Indeed, the oldest known recipe was found in a food and health manual printed in Turkey in 1330. Other claims include a Mesopotamian, Persian, or Byzantine background. This is just one of those foods that we’ll never really know for sure how or why it came about, but we can be thankful for because it’s so stinkin’ good regardless. I searched for “baklava” and “Portland” on Yelp and got a bunch of good hits. After skimming through the reviews, we settled on a Greek deli called Ozzie’s. Grabbed some gyros for lunch on Saturday, and brought back baklava. It was wonderful – crispy, chewy, and sweet. So you lost me at nuts but I will tell you this; it looks delish. Oh, it was. Nuts and all. Made our detour well worth it!